Currently, thousands of homes in Colorado have roofs that are covered by a roofing product that has been discontinued. This product is called T-Lock. With it's distinctive pattern and look, it is easy to determine whether or not your home uses T-Lock. Unfortunately, because this specific roofing system is no longer being manufactured and is no longer available for repair and replacement, if your roof is made with T-Lock materials and becomes damaged, it cannot be repaired. If there's one hail hit or instance of wind damage, it's very likely that your insurance company will replace your entire roof. T-Lock has been made to withstand wind, but has notorious issues with leaking. Even though they were rated to withstand winds up to 130 mph, their “wing” design actually acted like a sail and would rip off the roof during much slower wind speeds. Also, as asphalt became more expensive, fillers were used instead. These fillers would become very brittle over time. Their woven design and installation doesn’t offer solid protection against hail either. 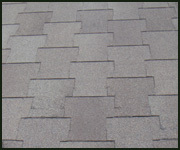 The weaves can create pockets and gaps between shingles that can be easily damaged by hail.